Camp Riverside is an intimate, well maintained, accommodating environment that sits on 20 acres adjacent to the Head Waters of the Colorado River and Arapahoe National Forest. We are located in Grand Lake, CO. There are a lot of things you can do at Camp Riverside - Frisbee Golf, Volleyball, Hiking Trails, Mountain Biking, Camp Fires, Horseshoes, Basketball, Recreation Field, Playground, Snowshoeing, Sledding Hill, Cross Country Skiing, and lots more. Camp Riverside is an intimate, well maintained, accommodating environment that sits on 20 acres adjacent to the Head Waters of the Colorado River and Arapahoe National Forest. This land has been set apart by God and is a special place for all who visit. With a setting in Grand Lake, the western entrance to Rocky Mountain National Park, Camp Riverside is the perfect place to unplug, enjoy God’s magnificent creation while connecting with others. Camp Riverside is available for retreats, camps, reunions and weddings. 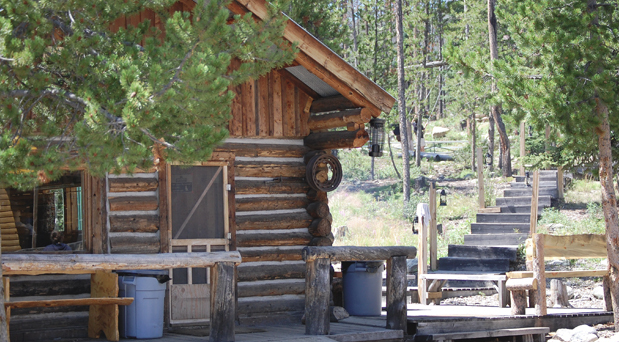 Camp Riverside is a clean, well maintained, accommodating environment that sits on 20 acres adjacent to the Head Waters of the Colorado River and Arapahoe National Forest. 2 rooms with 16 beds each, 1 room with 13 beds, 2 rooms with 4 beds each, 4 rooms with 2 beds each. Sleeping capacity for 61 people or more. A Cook House with do-it-yourself cooking includes: Outdoor Barbeque Grill, Commercial-grade griddle, 3 stoves, 3 refrigerators and 3 freezers. Seating is available both indoors and outdoors. In addition to the restroom and shower facilities inside the Main Lodge, there is also a separate bath house with male and female restrooms and showers. The Outpost is a place for fun, ping pong, foosball & other games. It can also be used for extra meeting space. Our Chapel is a rustic and enchanting place for a meeting space or worship. Seating for 100 and a stage area for worship or meeting. (303) 433.8665 for more info and reservations.